You can save money by keeping large denomination bills in your wallet or purse, according to an upcoming study on the denomination effect. The study, by The Journal of Consumer Research, found that people were more tight-fisted with their money if it's in a few large-denomination bills, as opposed to many small ones, according to a short story in the New York Times. This makes sense, when you think about it. I'm less likely to break a $20 bill for a small purchase, such as a soda, than I would be if it were a dollar bill. I think I'm also less likely to even purchase the soda if I had a $1 bill in my pocket, as opposed to change. The study found that 63% of test subjects chose to buy candy when given four quarters. But the number dropped to 26% who bought candy when given a $1 bill. So the denomination effect even works with small bills. "People overvalue these large bills," said Joydeep Srivastava, a professor of marketing at the University of Maryland and one of the study's two authors. "It's partly a self-control mechanism -- I want to hold onto it, because if I do break that big denomination, I lose track of my spending." True. 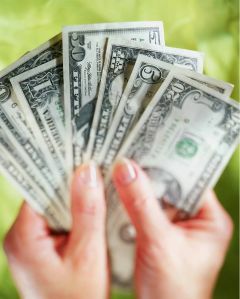 Try carrying around only bills, and not change, for a week and see how much longer your money lasts. The study notes, however, that this effect is stronger in markets like China and India, where cash -- and not credit cards -- is still king.